Spirit Camera: the Cursed Memoir is definitely unique. This is a game that resides neither in the cartridge slot nor the screens of the 3DS. Its soul is well-hidden between the sixteen pages of the AR book included in the thin white plastic box, a replica of the titular Cursed Memoir you find at the beginning of the game’s predictable story. While this is a spin-off of the cult-classic Fatal Frame series, this time around, instead of immersing the player in a horror adventure, Tecmo Koei soaks the real world with ghostly presences -- as the box says, “blurring the line between reality and the supernatural” -- using the vastly unexplored augmented reality, or AR, potential of the 3DS. The handheld acts as a pretend camera obscura – Fatal Frame’s gameplay hook -- and during the vast majority of the game the two screens will simply show an “augmented” version of the environment you’re playing in. The core gameplay lies in the interaction between the player, the 3DS, and the book. To make your way through the story, you’ll have to examine your real-world surroundings and perform tasks in the game, which range from finding characters hidden behind your seat to solving interactive puzzles that appear when the pages of the book literally come to life under the camera eye. Despite its legacy ties to those other games, Spirit Camera is very different from its Fatal Framepredecessors. Fans of the series will find nothing more than a handful of familiar plot devices: young, scared Japanese girls, haunted mansions, gory sacrificial rites and, of course, that camera obscura -- a device capable of imprinting otherworldly presences on its film to fend them off. The story mode, in fact, takes the form of a simple text adventure. It centers mainly on the monologues of Maya, one of the main characters -- who also happens to be a ghost inhabiting the pages of the titular Cursed Memoir. Even if the writing is rather shallow and confusing, and the story is nothing but a series of phoned-in clichés, there is still definitely something interesting about this game, something capable of sucking in the player from start to finish – and that’s all despite a number of problems that afflict the overall experience. Of course, everything works fine only when the memoir is placed on a flat and evenly-lit surface; otherwise the game may fail to detect its pages. This can be easily solved using, say, a cheap Ikea lamp, but even if Spirit Camera is not particularly spooky in the first place, it’s annoying to be hampered by the constant need to adjust the booklet while trying to figure out which page to read and expose it to the right amount of light. It’s a lot to ask. The story mode is not that long; it clocks around three hours. This is both a curse and a blessing. Spirit Camera is a disorganized gameplay experience that sometimes peaks with great ideas -- at one point, you’ll push a door open with your hand in real life -- and sometimes becomes terribly dull and uninspired, slowed down by unclear and vague hints about how to proceed or what to do next. 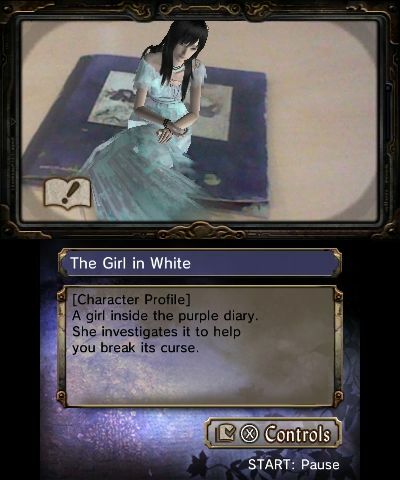 A great example of this inconsistency is the boss battles against the ghosts trapped in the book’s pages, which are reminiscent of the free app Face Raiders, which comes pre-installed on the 3DS. At first, these sections seem interesting and well-made, but they grow tired and repetitive very quickly, since you’ll rarely have to adopt a new strategy. Once the novelty of the wedding between 3DS motion controls and the camera-based battle system wears out, they turn into nothing more than a boring chore. As you can probably imagine, the most fatal of Spirit Camera’s issues is the lack of content and variety. A handful of extra modes and costumes don’t add much to the experience; this game would have been better as a digital download. As it is, the game provides an original and often even amazing way to interact with the player, but eventually the repetitiveness will tire out even the most enthusiastic horror fans, leaving the bittersweet feeling that it could really have been great with just a bit of extra polish and some diversity in design. Perhaps the most terrifying aspect of Spirit Camera: the Cursed Memoir is that, with its ups and downs, it completely fails to keep your interest and attention dead or alive. In that sense, it really is a game that embodies Schrodinger’s paradox, and, sadly epitomizes a missed opportunity.